Professor Moshe Pelli, Director of UCF Judaic Studies and Abe and Tess Wise Endowed Professor of Judaic Studies, has just published his new book by the Hebrew University’s Magnes Press in Jerusalem. This is the fifth book in the series of monographs and annotated indices on periodicals of the Hebrew Haskalah (Enlightenment). This 500-page book deals with two major Hebrew periodicals published in mid-nineteenth century: Hehalutz (1852–1889) and Bikurim (1864–1865), and addresses major developments in the history of Jewish religious thought and Hebrew literature in mid-century: The budding signs of modernism, and the emergence of radical Haskalah in Galicia. These trends found their mouthpiece in the journal Hehalutz, and was manifested in the contribution of its prolific editor, Joshua Heschel Schorr, who publishing 13 volumes of his journal. Schorr was an erudite scholar who was versed in the classical texts of Judaism, namely, the Bible, Mishnah, Talmud, Midrash and Halachah and the historical responsa literature. He examined these texts from a strictly free, critical and scholarly approach, and arrived at far-reaching conclusions regarding the observance of Jewish customs and religious laws. The first six volumes of HeÊalutz had important contributors, such as Abraham Geiger, Avraham Krochman, Moses Steinschneider, and Leopold Löw. They wrote essays and studies on the Talmud, Midrash, biographical sketches, medieval manuscripts and their authors, and on the Hebrew language and Jewish education, embracing the spirit of free probe and modern scholarship of Hochmat Israel (the scholarly study of Judaism). 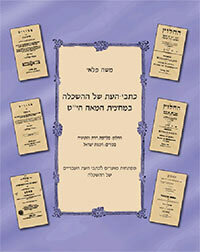 The second journal, Bikurim, published in two volumes, was edited by the poet and writer Naphtali Keller, and represented the moderate Haskalah and Hochmat Israel. Some of the major writers and scholars of that time – 28 of them – such as Aaron Jellinek, Eisik Hirsch Weiss, and Meir Halevi Letteris, contributed to this impressive literary and learned journal. They wrote belles lettres and scholarly studies on Bible, Mishnah, Talmud, Jewish history, Jewish holidays, Jewish education, Hebrew language, review of books, and civil rights. In belles lettres, they contributed prose, poetry, satires, among other literary genres. These writers also reported on the state of Jews in Austria, Galicia, Morocco and Sweden. The Indices to the two journals published in this book are cross-referenced, annotated, alphabetized, and author-and-subject listed. They cover all articles, essays, and scholarly studies on a variety of topics in Jewish Studies, such as Biblical and Talmudic criticism and commentary, questions regarding the Halachah (the religious code), and studies on the Hebrew language, Jewish history, and Jewish education. They also examined newly discovered medieval Hebrew manuscripts, and presented their critiques and studies of their authors. Also included are various genres in belles lettres: poems, stories, satires, biographies, and miscellaneous writings such as editorial comments and announcements. All these subjects are discussed and analyzed in the monographs of the two journals. The annotated indices should serve as a reliable reference tool for viewing and reviewing the major topics and issues that occupied the minds of the editors and the writers of these journals in Galicia and elsewhere in Europe in mid-19th century. Readers may now examine the scope and the character of the material published in these journals. Likewise, it is now convenient to assess the contribution of participating scholars, authors, and poets, to Hebrew literature, and to the scholarly study of Judaism, and to explore their stand on various scholarly or Jewish matters. Moshe Pelli, The Journals of the Haskalah In mid-Nineteenth Century: Hehalutz (1852-1889); Bikurim (1864-1865), Monographs and Annotated Indices to Two Hebrew Periodicals in Galicia; The Hebrew University Magnes Press, Jerusalem: 2015, 500 pp., bibliography, index, English abstract.